Sound involved? It can be - but if you do a little leg work in the beginning, your training videos will look better, and you will save everybody more time by cutting the fat before you hit record (as opposed to doing it in post production, or not at all). One bit of advice before you record - make sure you have a place to store your videos for viewing. If your company prohibits you from uploading videos to YouTube or some other service, figure out how and where your end-users will watch your training videos. An example goal might be - Help new Sales Associates feel comfortable creating an email template for X. Or it could be, Help seasoned Sales Associates understand the benefits of entering information about Y. Make your goals specific to an audience and to a purpose. This will help you create content for the video as well as help end-users stay engaged. There are great tools available for brainstorming and creating outlines, but I recommend doing it in Keynote or PowerPoint because each main point can be a separate slide that you will use later to break up your video. Creating an outline is a great exercise to help you boil down what is essential for accomplishing your goal, and what is not. Make it simple, and keep it focused - remember, you can always make another video to explain a nuance or a digression. If your videos are too long and all over the place, end-users will stop watching them. Your script doesn't have to be worthy of Hollywood - you just want to avoid cold recording yourself. If you go in without anything prepared, you are going to end up recording multiple takes and losing focus during your explanation. Spend 10-15 minutes writing down what you'd like to say. Also, you don't need to write everything down word-for-word - just the general things you want to cover. Your script helps you provide concise explanations, and include everything you want in the recording. Google docs is great if you want to collaborate with other team members, but any text editor will do. 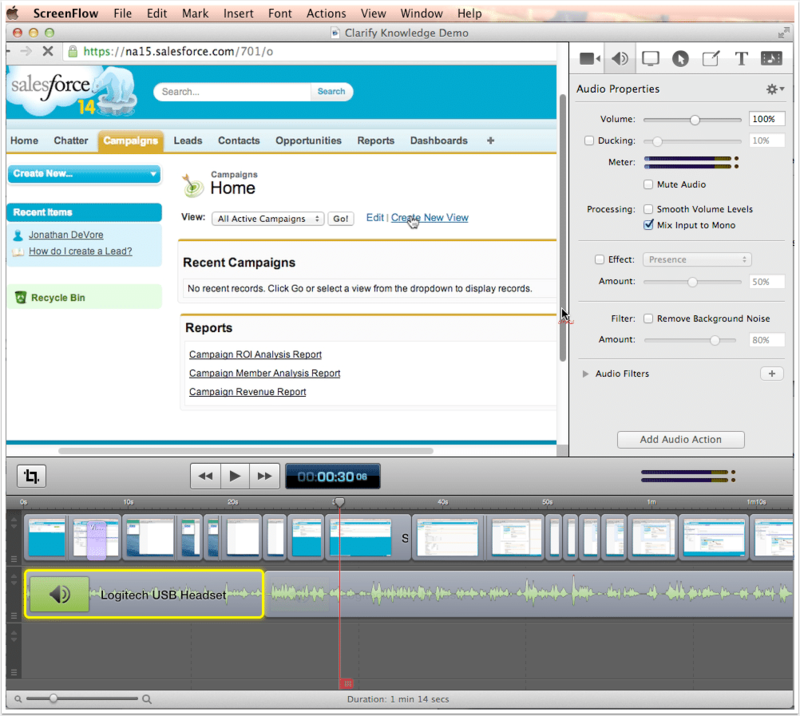 If your training video is just a recording of your screen, I recommend recording the audio first. When you record your screen and your audio at the same time, you'll find yourself digressing and taking 11 minutes to explain something that should only take 5 minutes to explain. You can get as fancy as you want, but any voice recording app will probably do the trick. Some examples include Garage Band, recording apps on your phone, Quicktime, or simply using a video editing app like Screenflow. Whatever you use, make sure the sound quality is decent, and record in a place withouth any background noise. I use Screenflow to record my screen. It's really easy to record, edit, and add effects. You can also use other tools such as Screenr, Camtasia, or QuickTime. If you recorded the voice-over before, then all you have to do is record on-screen actions while the voice recording plays. After you record your screen, cut out lengthy scenes of files uploading or your browser lagging. 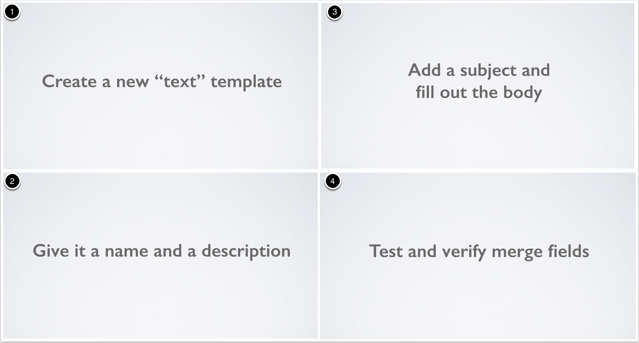 You can also break up the training video by recording your PPT slides you made during your outline - this will help your end-users follow along. However you decide to do it, make sure it's in a location and in a format that will make it easy to find and view - otherwise all of your effort will be in vain. That's it! If you follow those steps, you'll have a great training video that is specific, easy to watch, and extremely helpful to your end-users. Put in a little bit of time and you'll have a great resource that is reusable and effective.